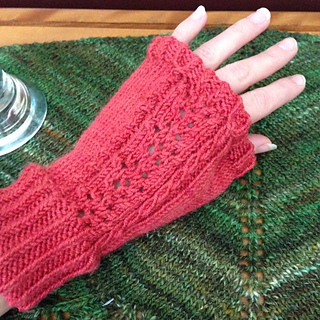 Fingerless mittens featuring lace paw prints and cables to remember your old friend. 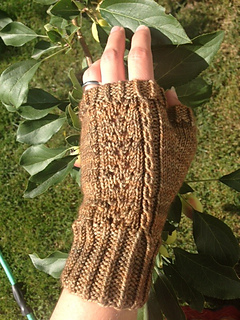 The ribbing from the cuff becomes the cable running up the length of the mitts, symbolizing the entwined life with our dogs. At the top of the mitt, the cables separate once again when they cross the rainbow bridge. Sizing can be achieved through gauge changes. 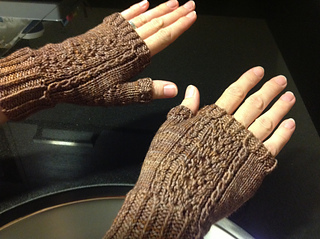 The pattern is written for magic loop, with a suggestion for stitch placement on dpns. Right Twist: hold first st on cable needle to back; ktbl next st on left hand needle, p1 from cable needle. Left Twist: hold first st on cable needle to front; p1 from left hand needle, ktbl from cable needle.